The League Cup itself doesn’t do well in earning respect either. Well, first, let me note that I’m calling it the League Cup because I don’t want to go through the effort of learning or recognizing the sponsor. It is currently sponsored by Capital One, which is the 7th sponsor of the cup since the Milk Marketing Board was the first sponsors of the cup in 1982. The legitimacy of the cup is also hurt by the fact that there are only a limited number of matches on TV, one of those not making the cut is today’s match between West Brom and Arsenal. You’ll have to find a choppy stream. Even with all of those negatives, I’d still contest that this tournament is good for Arsenal, at least right now. Arsenal’s form is as good as anyone right now and with that there are players who are playing well and can’t logically be spelled in those League and European matches. At the same time, there are good players like Arteta and Vermaelen returning from injury that need opportunities to return to match fitness. This is their chance. For the players that are doing exceedingly well, like Ramsey, Ozil, and Giroud, this is an opportunity for them to get some rest. By playing veteran players like Vermaelen and Arteta, Arsenal can couple that experience with the reserves that are expected to play and have a purpose beyond trying to win the tournament. And if those players do help the club advance in the tournament, Arsenal can devote more resources (the players that are playing well in the bigger competitions) down the road to seal up a potential trophy. Today’s opponent is West Bromwich Albion, who are currently 14th in the Premier League. The Baggies got to this round of the Cup by defeating League Two side, Newport County AFC, 3-0. While the start of the season hasn’t treated West Brom that great, the Midlands side is coming off a 3-0 win over Sunderland, which was the final nail in the employment of Sunderland’s fascist manager (had to get that in there). While the Gunners should be favored, there were easier opponents than West Brom that Arsenal could have been drawn against. One of the big disappointments of West Brom’s offseason was not being able to renew the loan of Romelu Lukaku from Chelsea. The big Belgian, who picked Everton over the Baggies, was a force for West Brom last season, netting 17 goals in 38 appearances. Peter Odenwingie (what a fun name to say!) and Marc-Antoine Fortune are gone too. Those three departures have left a lot of production for West Brom to make up. Besides Shane Long, West Brom is a collection of outcasts. Long has become a critical part of the West Brom squad, netting 11 goals last season. He brings some stability up front. Many of the other players have come from the “bigger” clubs. Ben Foster couldn’t cut it at Manchester United but has found a home at West Brom. Zoltan Gera moved to West Brom after leaving Fulham. Scott Sinclair is on loan at the Hawthorns after his disastrous transfer to City last season. West Brom also has Stephane Sessegnon. Oh and West Brom has Nicholas Anelka. Anelka, who is a world traveler, is on his 10th club since Arsenal sold him for 22.3 million in 1999. His journey has seen him go to Spain, France, Turkey, and China. Though he missed some time early in the season on compassionate leave, following the death of his agent, Anelka has factored in 4 Premier League matches this season, but has yet to score. I’m sure he’d relish a chance to get his first goal against his former club. The Arsenal squad is drastically changed from the weekend and the line up should be very different. Vermaelen and Arteta will obviously play, but look for Jenkinson and Monreal to also get starts here. Leading the line will be the guy who can’t move on, Nicklas Bendtner. Other than that, we should see a strong influence of youth. 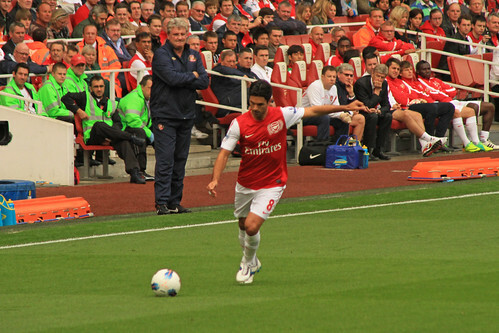 To advance, Arsenal will need to feed off the calming presence of Arteta in the midfield. If Arteta and the youngsters can control the midfield, Arsenal should be able to create chances and score goals. I’ll tip the Dane to be a guy on the score sheet here. More importantly, Arsenal needs a strong performance out of Vermaelen and the back four. Pfffft, how did you not know Hayden would be in the squad? This preview is useless. I didn't know Wenger had found his bravado. Oversight on my part.